The Droid Bionic unlock pattern is perhaps the most popular, and certainly the most unconventional, way to lock the Droid Bionic screen. The pattern must be traced on the touchscreen to unlock the phone. If no additional lock is set, choose Set Up Screen Lock; otherwise, choose Change Screen Lock. If you haven’t yet set a pattern, you may see a tutorial describing the process; touch the Next button to skip merrily through the dreary directions. Use the figure as your guide. You can trace over the dots in any order, but you can trace over a dot only once. The pattern must cover at least four dots. Redraw the pattern just to confirm that you know it. Touch the Confirm button, and the pattern lock is set. Ensure that a check mark appears by the option Use Visible Pattern, found on the Location & Security Settings screen. That way, the pattern shows up when you need to unlock the phone. For even more security, you can disable this option, but you must remember how and where the pattern goes. To remove the pattern lock, set None as the lock type, as described in the preceding section. The pattern lock can start at any dot, not necessarily at the upper-right dot, shown in the figure. 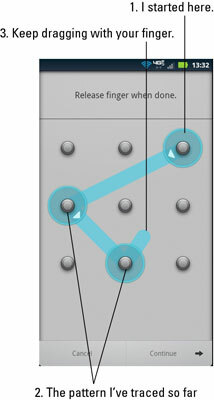 The unlock pattern can be as simple or as complex as you like. Wash your hands! Smudge marks on the display can betray your pattern.